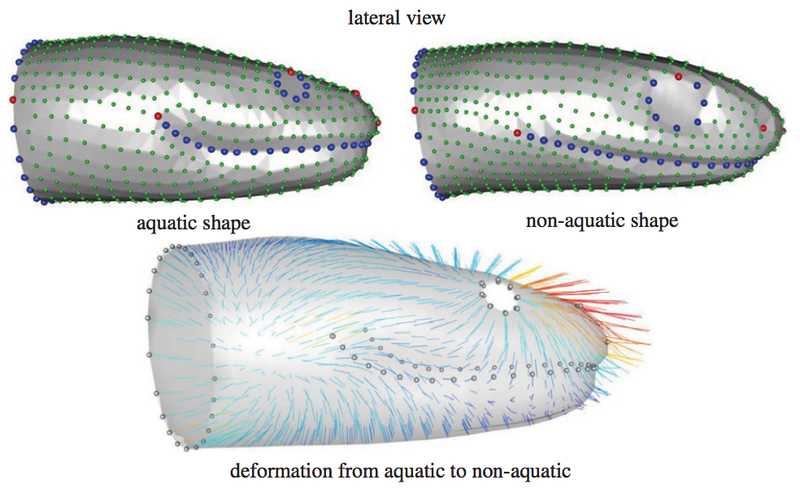 shape evolution in snakes and whether shape converges on that predicted by biomechanical models. To do so, we used three-dimensional geometric morphometrics and comparative, phylogenetically informed analyses on a large sample of aquatic snake species. Our results show that aquatic snakes partially conform to our predictions and have a narrower anterior part of the head and dorsally positioned eyes and nostrils. This morphology is observed, irrespective of the phylogenetic relationships among species, suggesting that the aquatic environment does indeed drive the evolution of head shape in snakes, thus biasing the evolutionary trajectory of this group of animals.